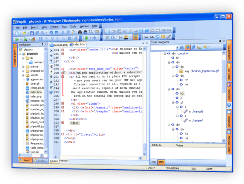 PhpED provides full array of HTML editor tools. Our IDE comes with WYSIWYG features for HTML elements and tags, full support for Dynamic Syntax Highlighting , Multiple Language Syntax Highlighting of HTML and other languages and other Editor Tools. There are also specific features designed to provide for the most productive HTML Editing. When you are working on an HTML file in the Editor you are just one click away from seeing the results of your work - at any stage of work. You can select HTML Preview tab of the editor and see how the file will be rendered in the browser. For example, see how the file shown in the editor is displayed in preview. PhpED's Code Completion is working for you whether you are editing PHP or HTML code. Code hints are provided for both tags and tag's attributes. 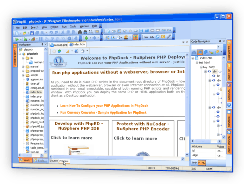 Other great PHP and HTML Editor features are PHP Code Folding and HTML Code Folding. Please see the illustrations of HTML Code completion and HTML Code folding.